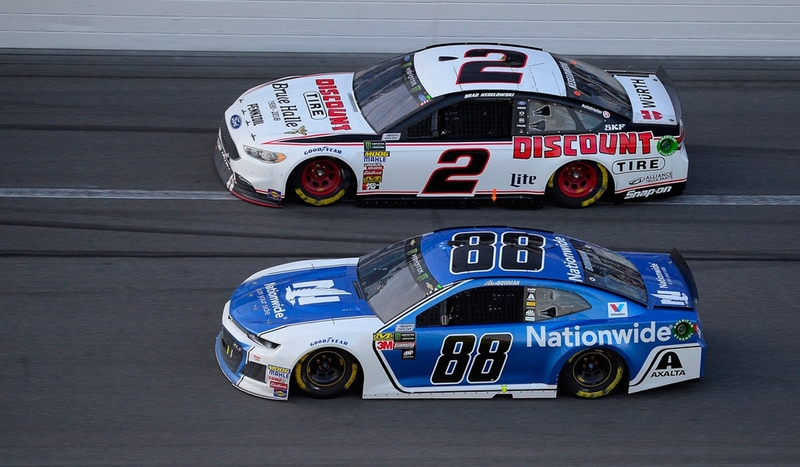 It was a Daytona 500 filled with promise for Brad Keselowski and the 2Crew, but as is often the case in restrictor plate racing, a moment of calamity changed everything. Brad started 31st and steadily worked his way through the pack from the drop of the green flag, climbing into the top 10 by lap 29. But the nose of his Ford came unsealed from the car’s front splitter during the early laps of the race, and the team pitted under caution on lap 51 to repair the damage. He restarted outside top 30 when the race went green on lap 55. Brad racing Alex Bowman during the Daytona 500. Crew chief Paul Wolfe chose not to pit during the stage break on lap 61, moving Keselowski up to sixth position for the restart on lap 66. He consistently jockeyed for position near the front of the lead draft and was third at the time of the caution on lap 94. He pitted for right-side tires one lap later and lined up third when the race went green on lap 97. Brad was racing Chase Elliott for second-place on lap 102 when the two made contact at the entrance to Turn 3, triggering a multiple car accident and ending his afternoon. He was credited with a 32nd-place finish in the final rundown.